Thank you! Your inquiry has been submitted. We will be contacting you via your given email or contact number. When you say box-office queen, fashion icon, top celebrity endorser, and concert sensation, the name Anne Curtis comes to mind. There’s no stopping the Princess of all Media as she adds another title to her belt this year--YES! Magazine’s Most Beautiful Star for 2012. The 27-year old TV host/actress was recently proclaimed as YES! Magazine’s Most Beautiful Star in a press conference held last July 2 at the Eastwood Richmonde Hotel. The YES! 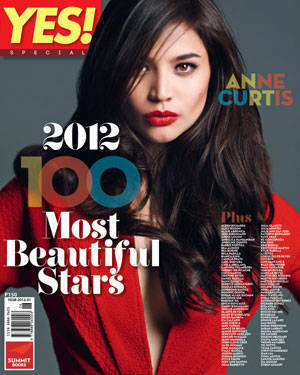 Most Beautiful Stars Special features 100 of the prettiest faces in showbiz. Grouped into 17 different categories, stars were classified according to beauty, talent, star quality, and personality. Anne Curtis, Alice Dixson, Lovi Poe, and Erich Gonzales were among the female celebrities who made the list. 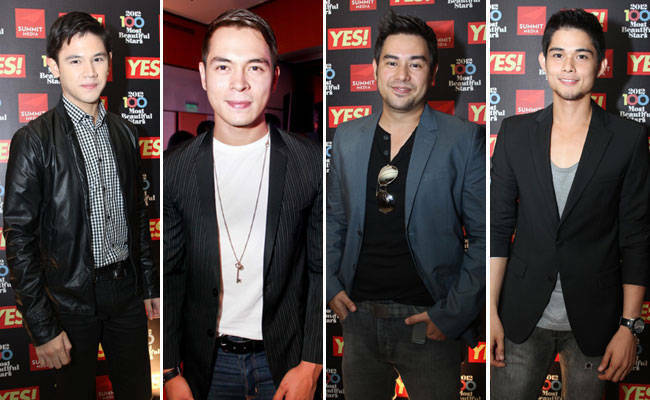 Among the male stars who graced the press launch were Martin Escudero, Jake Cuenca, Gabby Eigenmann, and Carlo Guevara. Naming 100 of the most beautiful stars in showbiz has been a tradition for YES!. Now on its sixth year, the YES! Most Beautiful Stars Special is an annual highlight to all its readers and celebrities. Find out who else made it to this year’s list! Grab a copy of YES! 100 Most Beautiful Stars Special for only P150. Also, grab a copy of the July issue of YES!, which features ABS-CBN’s biggest stars as Star Magic celebrates its 20th anniversary. YES! is available in all newsstands, bookstores and supermarkets nationwide for only P100. You can also become a fan of YES! on Facebook via Facebook.com/yesmagazine.ph. A digital version of YES! is also available. Visit PEP.ph for subscription details. Get books and magazines for as low as P10 from April 4 to 6! Experience a fresh spin on sports, fitness, and the culture beyond the game. The latest from Cloak lets readers choose the heroine's fate. Marvel at moments from the weddings of Anne and Erwan, Heart and Chiz, Solenn and Nico, and more. I agree that my personal data will be stored in a database and waive any and all claims for invasion of privacy rights. I also allow Summit Media to use my personal data for the purpose of sending me the latest news, promotions, or offers. © 2016 SUMMIT PUBLISHING INC. ALL RIGHTS RESERVED. © 2016 SUMMIT PUBLISHING INC.